WASHINGTON (AP) Symbols carved on stones 2,600 years ago in Mexico suggest that the Olmecs, an early North American people, invented the first writing system in the Americas and that the symbols were adopted by later cultures such as the Mayas. The symbols were found on chips from a stone plaque and on a cylinder stone used for printing that were unearthed in an archaeological dig at the site of an ancient Olmec city near La Venta on the Gulf of Mexico coast of southern Mexico. "These symbols have a very close resemblance to symbols that were found from a later era among Mayan artifacts," said Kevin O. Pope, a coauthor of the study. "We think the writing was developed by the Olmecs and then adopted later by the Mayans." Age dating of the artifacts suggests they were deposited on the site in about 650 B.C., about 350 years before the date of specimens previously thought to be the earliest examples of Mesoamerican writing. The Olmecs are thought to have established a large and complex culture starting in about 1300 B.C. They built massive pyramids, carved intricate and detailed sculpture and built large cities with thousands of people. The Olmecs are credited with creating a political state, with rulers and royalty, and a formal government. Pope, a scientist with the Maryland group called Geo Eco Arc Research, said the Olmecs culture collapsed by about 400 B.C., not long after the Mayan culture began to rise farther south. Mary E. D. Pohl, first author of the study and a researcher at Florida State University in Tallahassee, said it was known that the Olmec originated many of the cultural traditions later adopted by other cultures in the Americas. But evidence of writing was missing until now. "Since the Olmec were the first to put together a political state, and writing is closely connected with rulers in terms of publicizing their power, it makes sense that they would be the first to use a system of writing," said Pohl. Pohl said the artifacts were found in a large deposit that included shards of pottery and drinking vessels, animal bones and hollow figurines. She said these items may have been discarded in a ritual associated with a feast or celebration. The most complete specimen is a cylinder with raised carvings on the outside. The researchers believe it was used as a rolling imprinting device, probably to apply the symbols to cloth or even to human skin, said Pope. 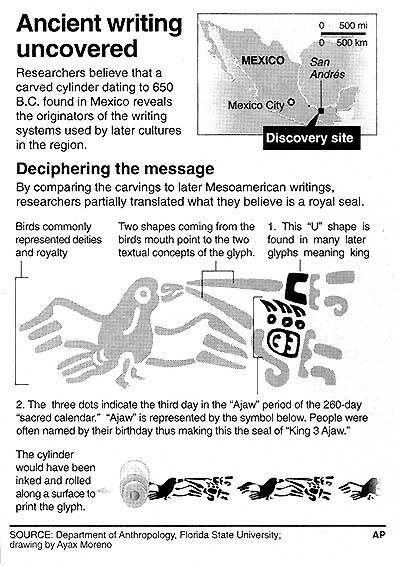 On the cylinder is a symbol of a bird, wings extended, with lines leading from the mouth to additional symbols to one side. Pope said the symbol represents the words "King 3 Ajaw." This could refer to either the name of a ruler or to a specific day of the year, or both, he said. The word "3 Ajaw" has been linked to a day in the so-called sacred calendar, a time-keeping system developed by the Olmecs. It divides the year into 13 periods with 20 days each and apparently was not based on any astronomical observations. "The symbol looks just like the later Mayan glyph for Ajaw," said Pope. Pohl said that the cylinder was probably used with ink to imprint the king's symbol on clothing or skin to demonstrate that a person was one of the elite, linked directly to the king.